American Pharoah made history on June 6, 2015, when he won the 1.5-mile Belmont Stakes race to complete the first Triple Crown in 37 years. Victor Espinoza rides atop American Pharoah as they cross the finish line to win both the Belmont Stakes, and Horse Racing's prestigious Triple Crown at Belmont Park in Elmont. June 6, 2015. American Pharoah, center breaking out of the gate in the start of the 147th Running of the Belmont Stakes at Belmont Park Race Track in Elmont June 6, 2015. American Pharoah jockey Victor Espinoza waves to the fans after winning the triple crown in the 147th Running of the Belmont Stakes at Belmont Park Race Track in Elmont June 6, 2015. American Pharoah runs his way to the Triple Crown in the 147th running of the Belmont Stakes at Belmont Park Race Track in Elmont on Saturday, June 6, 2015. Horses break from the gate at the start of the 147th running of the Belmont Stakes on Saturday, June 6, 2015 at Belmont Park in Elmont. American Pharoah, center, breaks out of the gate at the start of the 147th running of the Belmont Stakes at Belmont Park in Elmont on Saturday, June 6, 2015. American Pharoah bursts out of the gate at the start of the 147th running of the Belmont Stakes at Belmont Park in Elmont on Saturday, June 6, 2015. American Pharoah takes the lead at the start of the 147th running of the Belmont Stakes on Saturday, June 6, 2015. American Pharoah, ridden by jockey Victor Espinoza, runs down the front stretch during the 147th running of the Belmont Stakes on Saturday, June 6, 2015 at Belmont Park in Elmont. American Pharoah leads the way in the final stretch of the 147th running of the Belmont Stakes at Belmont Park in Elmont on Saturday, June 6, 2015. American Pharoah, ridden by jockey Victor Espinoza, wins the Triple Crown at the 147th running of the Belmont Stakes on Saturday, June 6, 2015 at Belmont Park in Elmont. American Pharoah and Victor Espinoza lead the pack as they approach the finish line during the 147th running of the Belmont Stakes at Belmont Park on Saturday, June 6, 2015, in Elmont. 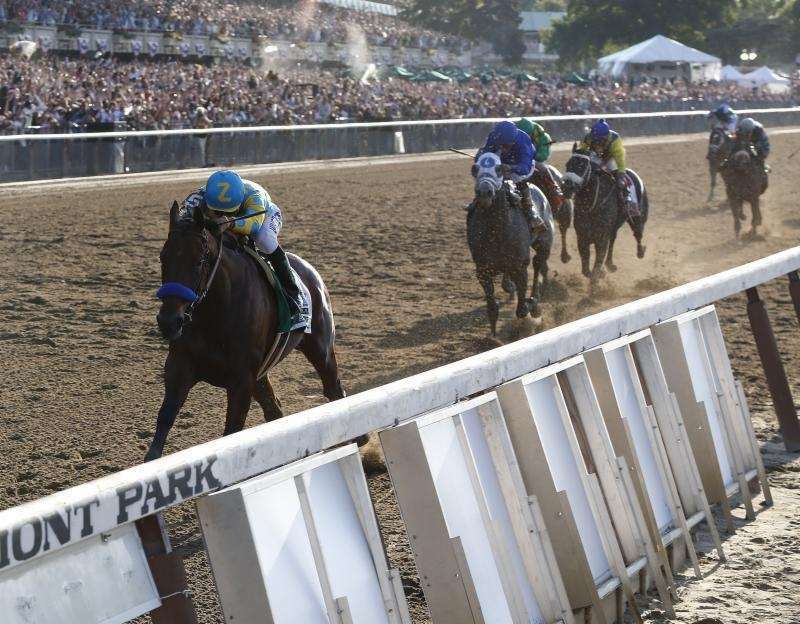 Triple Crown winner American Pharoah crosses the finish line at the 147th running of the Belmont Stakes on Saturday, June 6, 2015 at Belmont Park in Elmont. American Pharoah wins the Triple Crown in the 147th running of the Belmont Stakes at Belmont Park in Elmont on Saturday, June 6, 2015. The crowd celebrates as American Pharoah wins the 147th running of the Belmont Stakes on Saturday, June 6, 2015 and became the 12th horse in history to win the elusive Triple Crown. Jockey Victor Espinoza and American Pharoah cruise after the finish line after winning the 147th running of the Belmont Stakes on Saturday, June 6, 2015 and becoming the 12th horse in history to win the elusive Triple Crown. Victor Espinoza celebrates atop American Pharoah after winning the Triple Crown at the Belmont Stakes at Belmont Park in Elmont on Saturday, June 6, 2015. American Pharoah jockey Victor Espinoza waves to the fans after winning the Triple Crown in the 147th running of the Belmont Stakes at Belmont Park in Elmont on Saturday, June 6, 2015. Jockey Victor Espinoza sits atop American Pharoah after winning the Triple Crown in the 147th running of the Belmont Stakes on Saturday, June 6, 2015 at Belmont Park in Elmont. Jockey Victor Espinoza and American Pharoah make their way to the winner's circle after winning the 147th running of the Belmont Stakes on Saturday, June 6, 2015 and becoming the 12th horse in history to win the elusive Triple Crown. 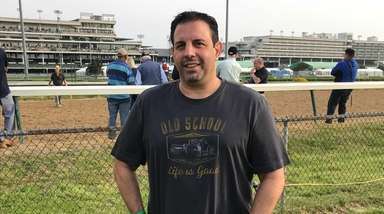 American Pharoah wins Triple CrownAmerican Pharoah ends the 37-year drought and becomes the 12th horse in history to win the Triple Crown by winning the Belmont Stakes going away. Triple Crown winnersOnly 12 horses have won all three races.